Pocoyo is on tour in Portugal! Pocoyo is on tour in Portugal with two live shows, the Panda Festival and Heróis da TV, which will take place during the months of June and July, and throughout 2017 respectively. 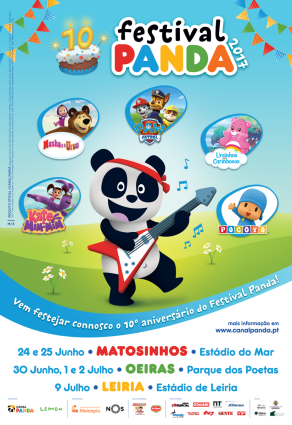 In this new edition, the Panda festival will celebrate its 10th anniversary with the presence of the most beloved characters of the Panda channel on stage, amongst which is Pocoyo. The celebration will take place on the 24th and 25th of June in the Estádio do Mar in Matosinhos, the 30th of June and the 1th and 2th of July in the Parque dos Poetas in Oeiras, and finally on the 9th of July in the Estádio de Leira in Leira. Heróis da TV is a live show where the filming of a talent contest is recreated, in which, during an hour and a half, the audience will be able to see four of their favorite characters perform, including Pocoyo. The competitors, 3 Porquinhos, Winx, Vila Moleza and Pocoyo, are the Heróis da TV in this talent contest, whose driving forces are the music and audience interaction, actively participating as part of the recording of this “TV program”. 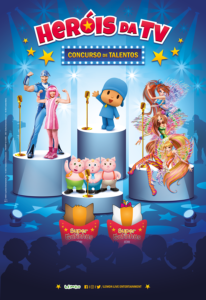 Heróis da TV is an innovative format in which children and their families will spend a fun time choosing the winner of the talent contest, in which Pocoyo will stand out with many of his musical hits.